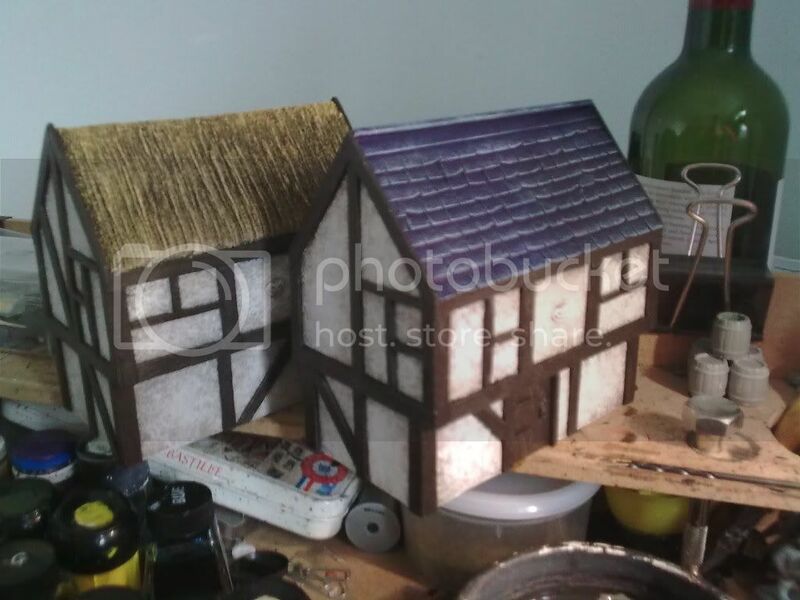 This is a long and rambling tutorial on how to make the little houses for warhammer we have at the club written a few years back. I have been asked to repost. I feel like I have tried to write these before and failed but I will try again. 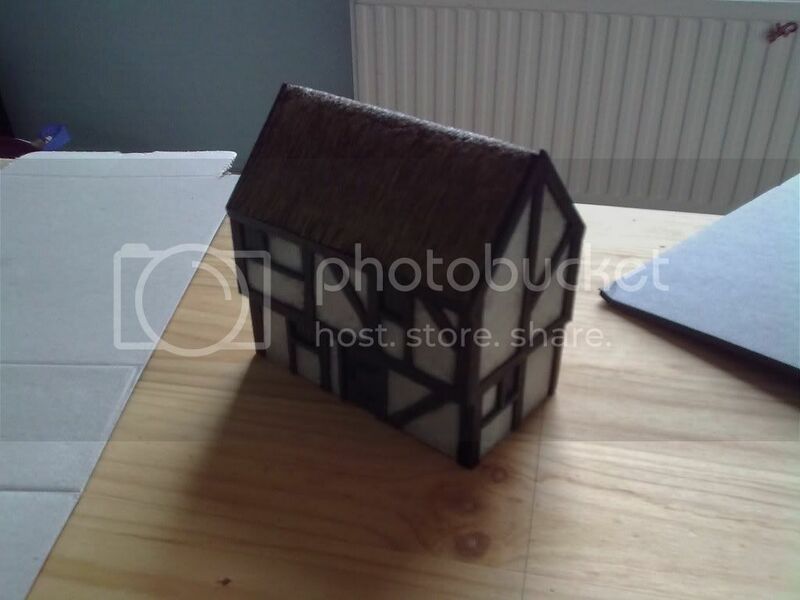 Essentially this is a tutorial on how to make a box and decorate it too look like a timber framed house. Sounds simple enough but there are ways to make your life easier and enable you to make more, faster and prolong the life of the end product. 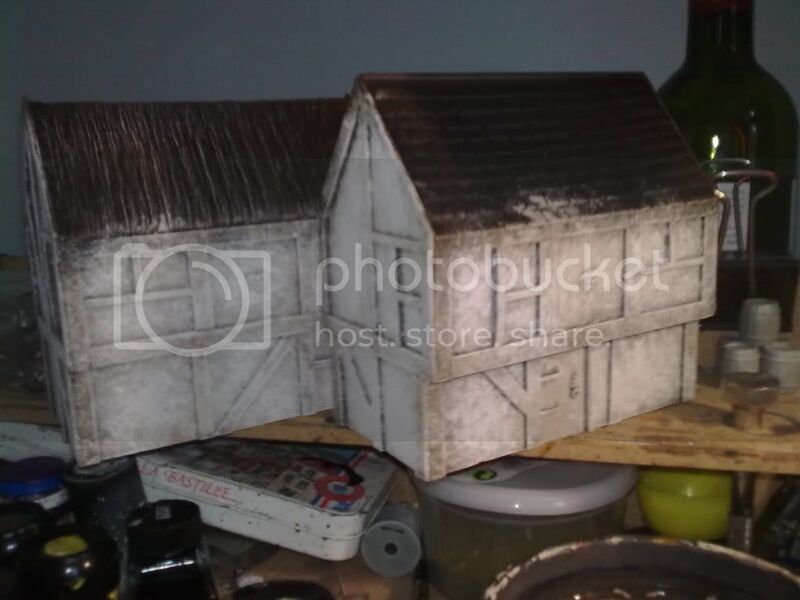 I will say that this is a tutorial on making a piece of wargames scenery for rough use in a store or club. I’m sure there are better, more elegant pieces that could be made but frankly in a club environment if you can’t throw it and know that it will not require repair probably best you keep it at home. The earliest versions of these were made 9-10 years ago and now in use at a wargames club in Hemel Hempstead (not HHGC). The other good thing about these is that they can be made on mass pretty quickly I’ve made about 40 of them in total in various forms for various stores, clubs and for my own use. 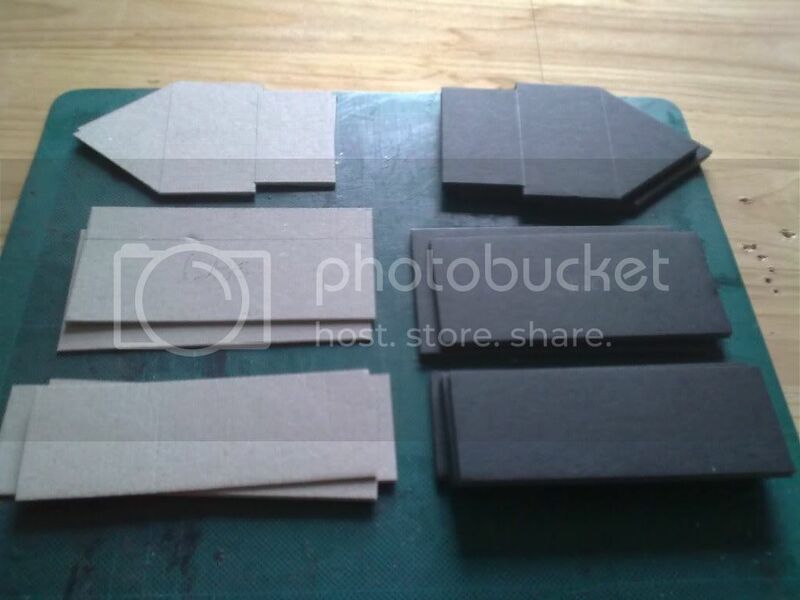 This is what I am making; one out of foam-board (sometimes called foam-core) and another out of some old rubbish just to prove that you can make all of this for nearly free. Craft knife Always use a sharp knife, it will make your life easier in the long run. Pencil When you draw use a sharp pencil and a ruler, this too will make your life easier. 1. Depending on the size of your base material and the number of buildings you wish to make cut a strip either 11.5cm or 18cm wide. 2. Mark bands 3.5cm wide along its length, as many as will fit, every two will make a side. With the corrugated card I made sure the lines of the corrugations ran the breath; should any of them show through on the finished model it’ll look less odd. 3. Decide which edge will be the base (both in the case of an 18cm wide strip) and from that edge draw a line 3.5cm and then another 7.5 from that edge. Now I didn’t do this properly here (coz I only need 2 sides) but you can see the lines in step 3 and a line 11.5 from that edge in the picture and it’s clear I could have got another couple of sides from the other side. 1. 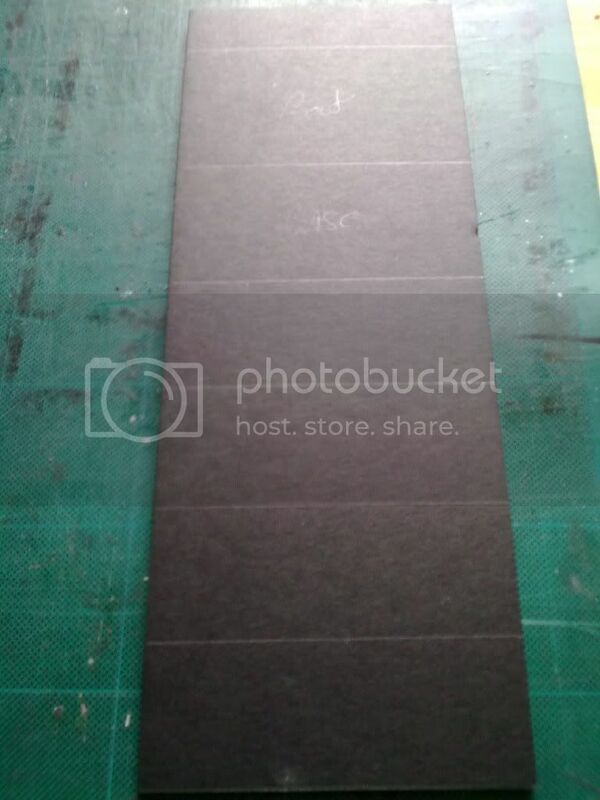 Cut a long strip of card or foam board 11cm wide or 12cm if you’re using very thin corrugated card. Before the house construction can start you need to just trim out the overhanging upper floor on the house sides, that’s what the 3.5cm line up from the base is marking. With a craft knife cut about 0.5cm in and down. The construction is simple, all the walls, base and roof are sandwiched between the house sides. 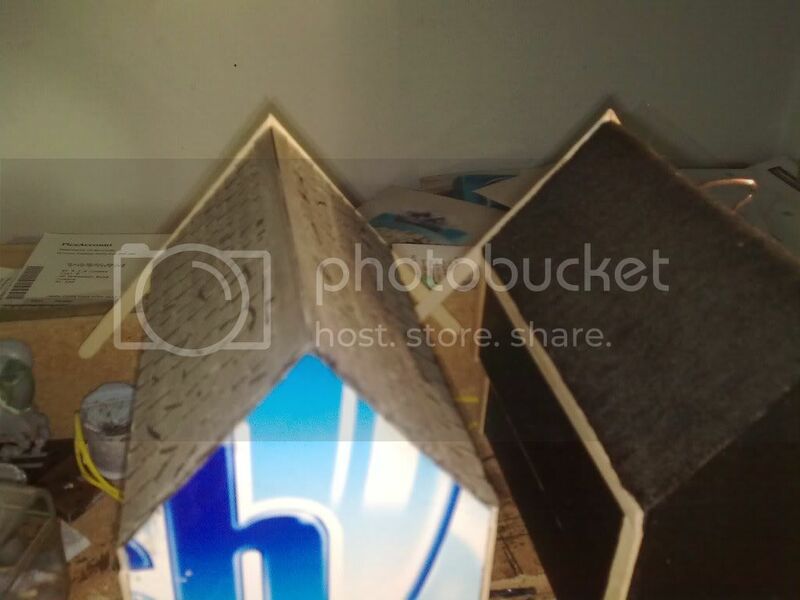 I start by gluing the lower walls on and then use the base to help it keep the shape with pins to hold the pieces in place I worked out later that the card works better with masking tape rather than pins. Pins still good with foam board. I squiged a bit of extra glue into some little >1mm gaps that appeared in the foam board version and added some more pins. 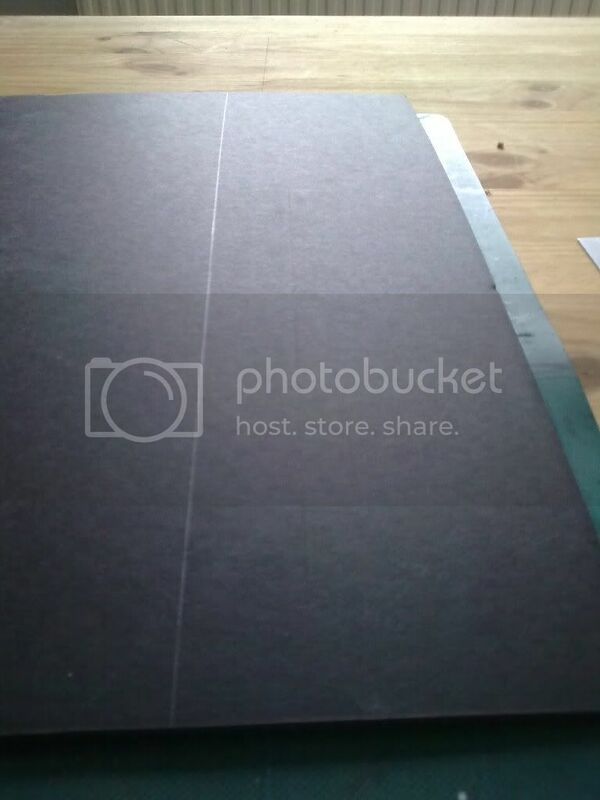 Little errors in cutting can easily be overcome like this but the ideal is that they are pretty small. 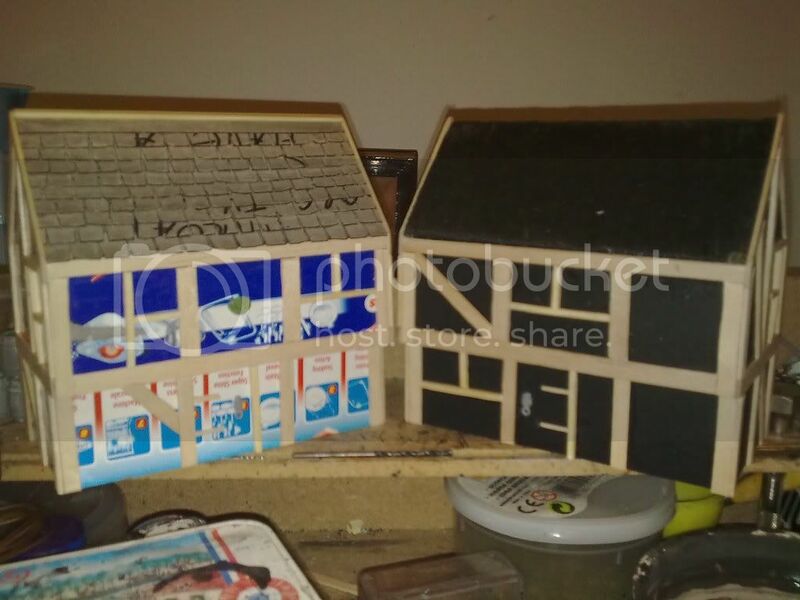 Once the bottom floor is dry (if you’re making half a dozen then it’s not a problem) add the second floor, the walls will overlap and may even touch, add glue if they do, not a problem if they don’t. 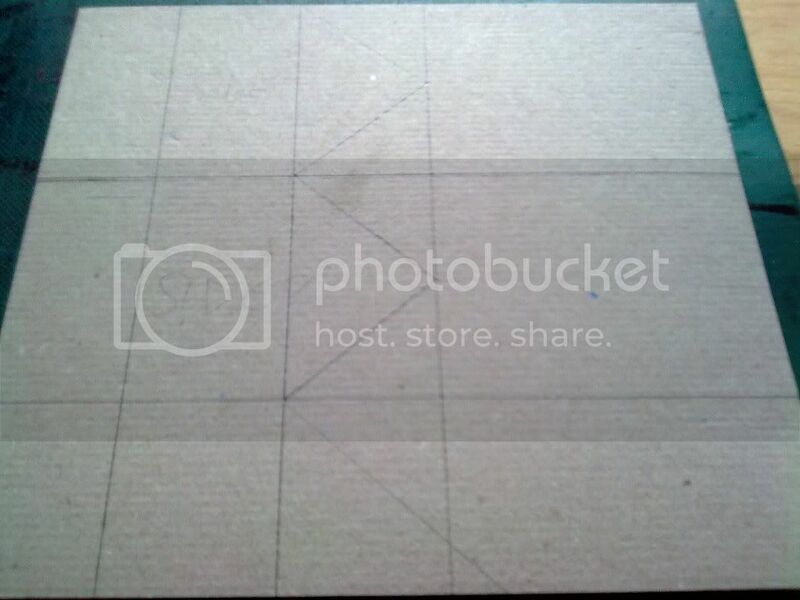 I added some internal bracing (which you can see in the picture) to the cardboard one coz the card was so thin. Probably doesn’t need it. Again once dry add the roof. These bits often need trimming so the shot below just goes to show that perfection is not required on this bit. The card house shows some tabs I put in on a whim and the foam board one shows some random off cuts from the “walls” strip I added to fill the space. Waiting for bits to dry I began cutting strips like these out of an old cereal box, they’re about 1.2 cm wide (didn’t measure it) and I have clipped out little V shapes these will be the roof tiling on the card house. And here it is glued on with both sat of the radiator drying. Once the glue under the fur was dry I used scissors to trim off where it overlapped the building at the sides and along the walls. 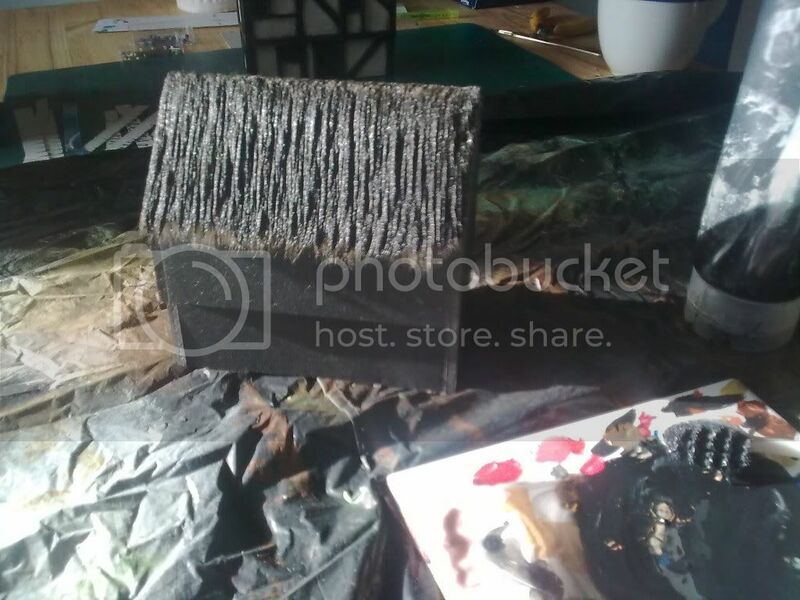 Then used an old toothbrush to comb it straight and then using the same toothbrush smeared on a mix of black paint (1part), PVA (4parts) and water (4 parts). This’ll take overnight on the radiator to dry properly it’s also can be very messy if as it takes quite a lot to stick down the teddy bear fur, I’d suggest putting some plastic sheeting (a bin bag) down just in case. 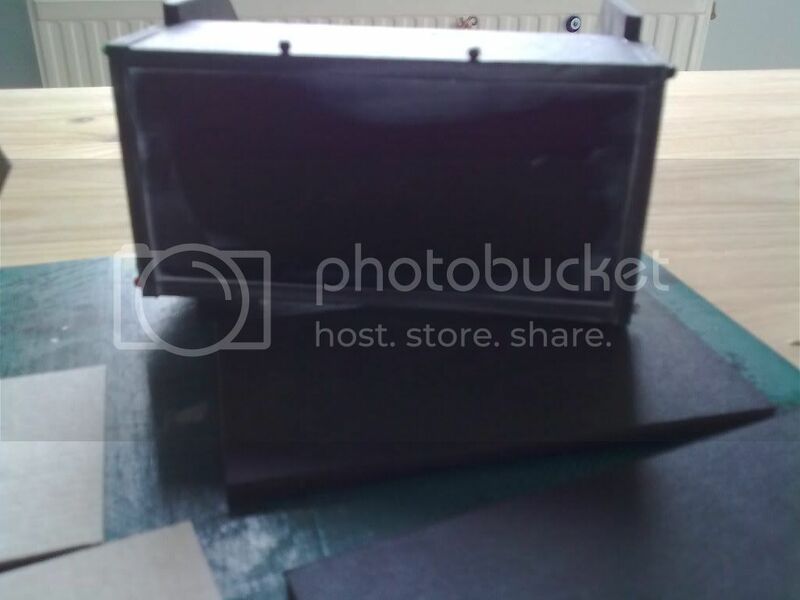 Black paint mixed with PVA will not come out of anything. 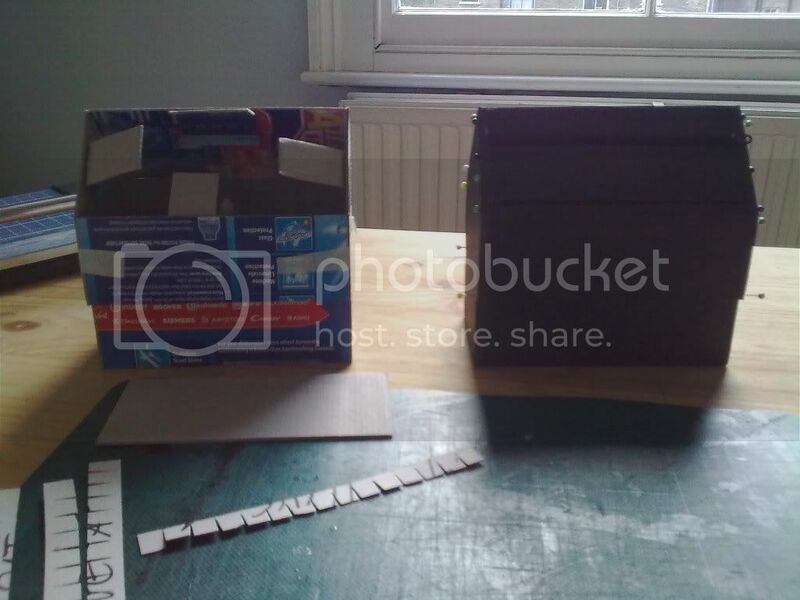 The strips cut earlier were added to the cardboard house. Working from the bottom of the roof upwards and letting the strips overhang about half the width of the previous one. Each side took around 9 strips. The idea was that they cover the splits in the previous layer but as you can see from the picture this didn’t quite happen (no matter). If I were bothered by such things rather than free hand cuts I could have drawn on some light and evenly spaced perpendicular pencil lines onto the card before I cut it into strips and followed them when making cutting the little V shapes. 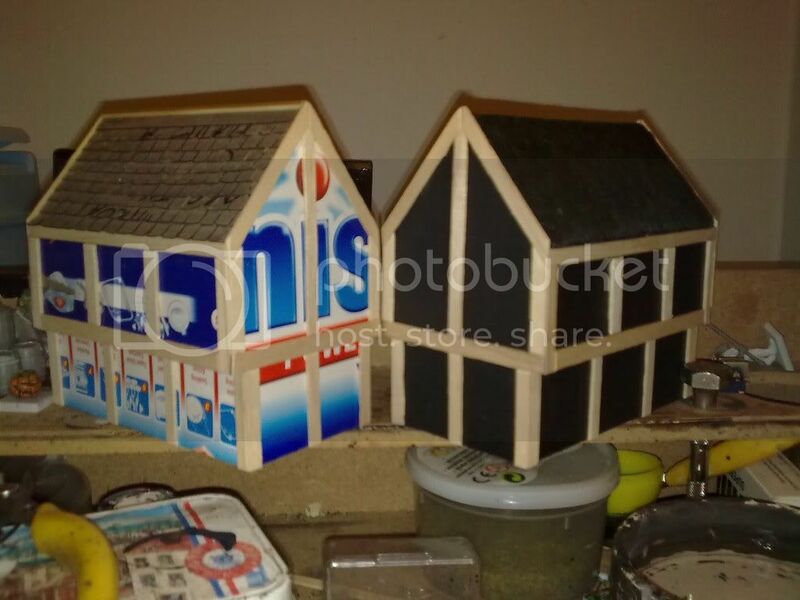 As I was gluing them on they over hung the sides of the house but as with the fur trimmed house once the glue was dry I used a pair of scissors to trim them back. At the top I added a 1cm wide strip scored down the middle to cover the top (0.5cm each side). I also gave it a quick wash of PVA (1 part) and water (3 parts) just to try and seal the cardboard. You could keep going on this one as it probably only need 30 mins to dry. 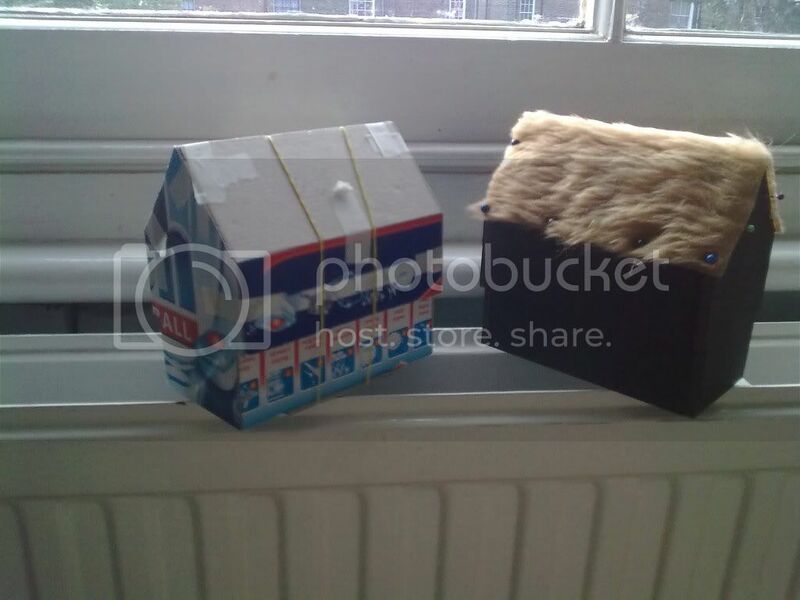 With the teddy bear fur thatch dry we can start decorating the house shaped box. First off I trimmed the ragged lower edges of the teddy bear fur thatch on both sides and then glued the edge down beneath a coffee stirrer, glued on top and held in place with pins while the glue dried. This provides the eaves and neatens off the thatch and stops small children picking at it latter on. These are the only bits of coffee stirrer that really need to be held on while they dry, unless the stirrer you’re using is particularly warped. 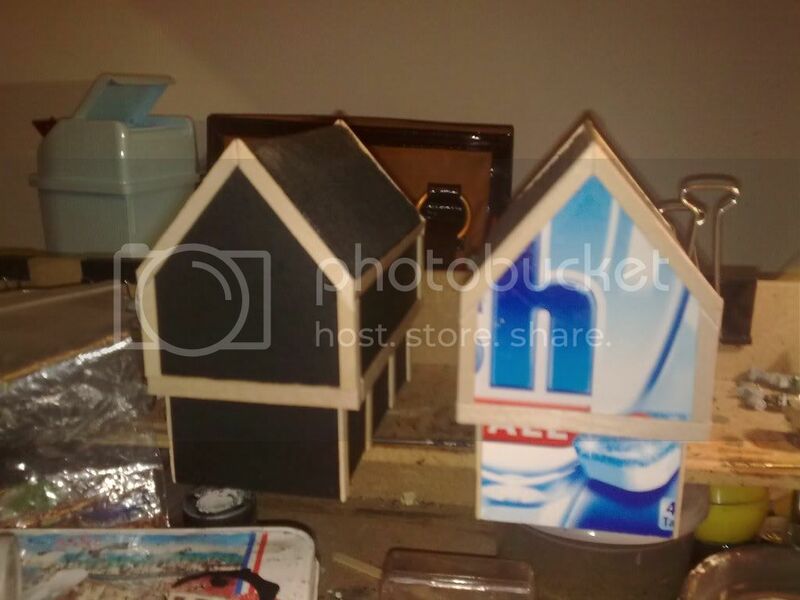 I glued the same pieces in place on the cardboard house. 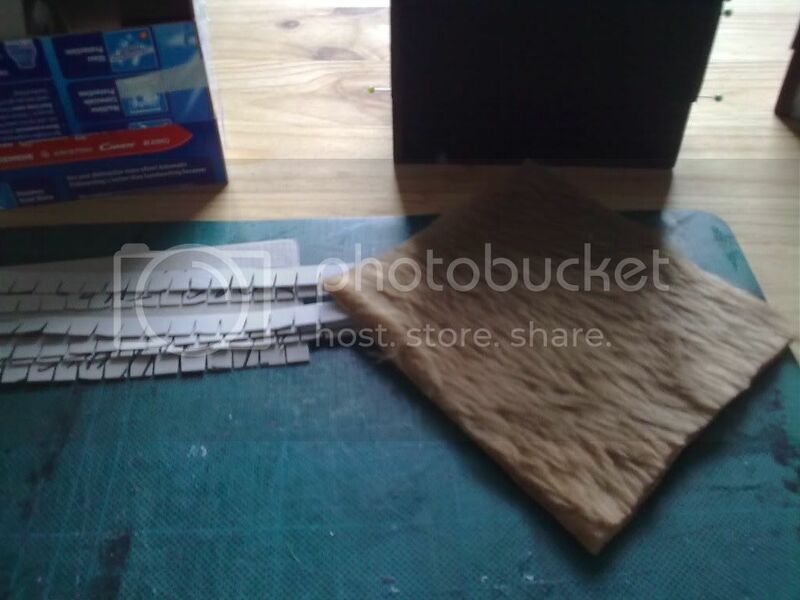 Here the coffee stirrer is providing support for the lowest row of card tiles. Over time these are the bits most likely to fray and look shabby so any protection we can give them is good. Next I glued a coffee stirrer under the over hang of both houses. 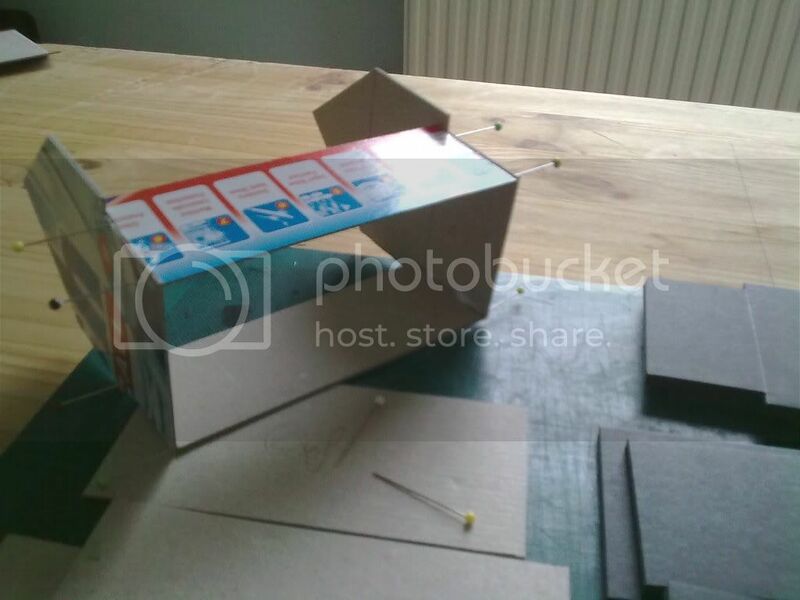 On the cardboard one it covers an actual hole in the construction and probably adds some structural strength. On the foam broad one it covers a downward facing foam board edge so it’s probably not required but I wanted to keep them the same. worth noting that at no point do I measure any of these pieces, I just glue them on and clip them to size with the GW clippers. All the effort of measuring stuff goes on at the box making stage; the more time you spend there the easier the bits that come after are. Once the glue on these is dry, use the clippers to trim them back to the very edge of the house. The closer you can get the clippers to the edge the better, flat edge GW clippers are obviously perfect for this. 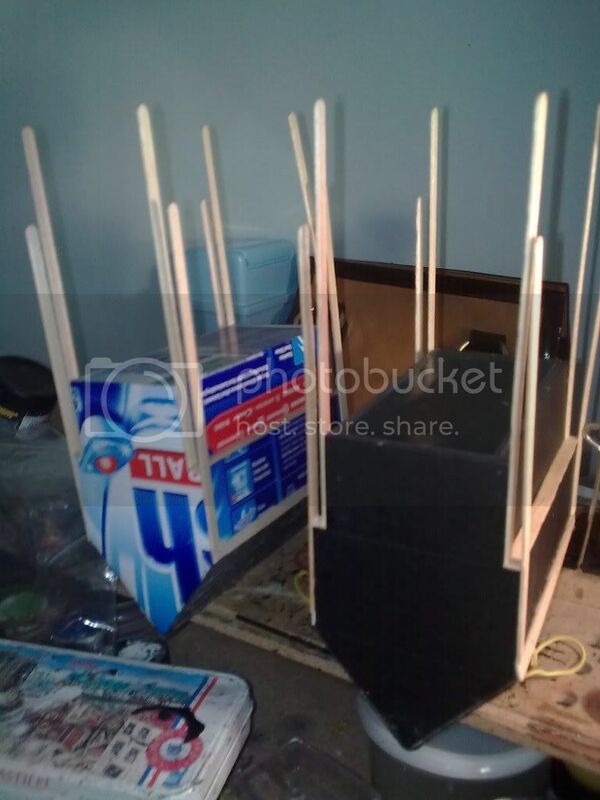 From this point forward the stirrers can be glued on in pretty much any order. Having made a bucket load of these in the past I have tended to work to a bit of a pattern with them, most important to me was to make sure that the rough edges of the building, where poor cutting can bee seen, are covered. 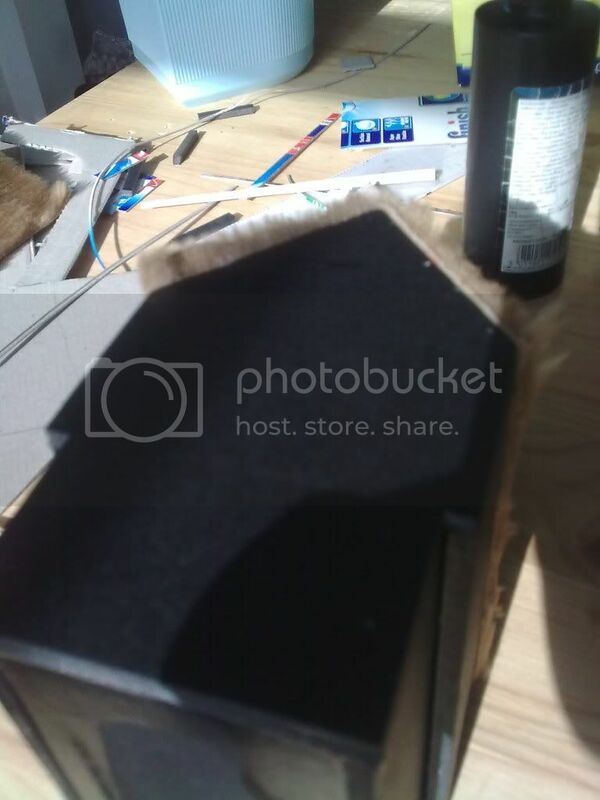 Key areas are the edges of the house sides where you can see the core of the foam board or the corrugations of the cardboard that kind of thing. I started with them. Clipping one end of each coffee stirrer flat I butted each up to the eves of the previous floor and just left to dry for 10 minutes. One dry I cut off the access again as close to the edge of the house as possible. 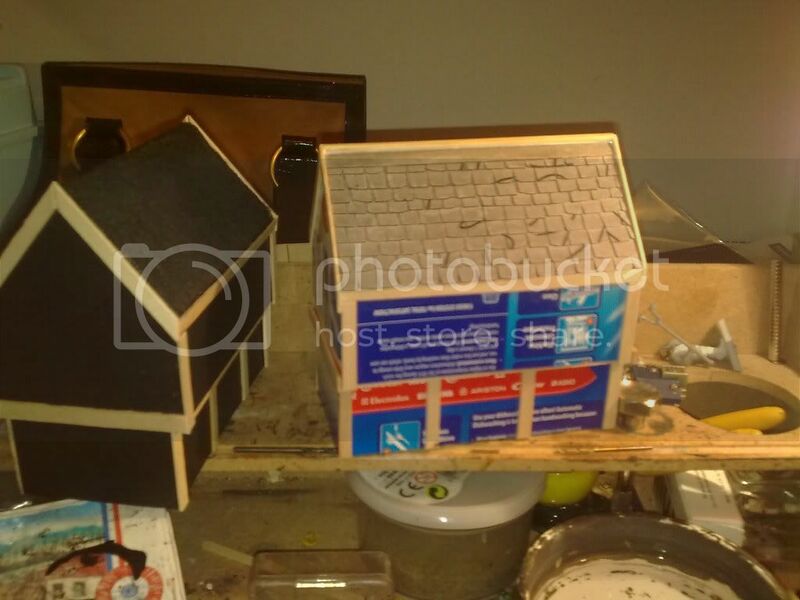 If you have been making lots quickly you and find that at the finished box stage the houses rock a little, as the material has warped or as a result of poor cutting/ construction, you can leave one end of the stirrer a fraction longer to stabalise the structure. If you don’t clip them back properly you can also introduce a rocking effect if you’re not thorough. Next I moved on to the eves at the house sides. 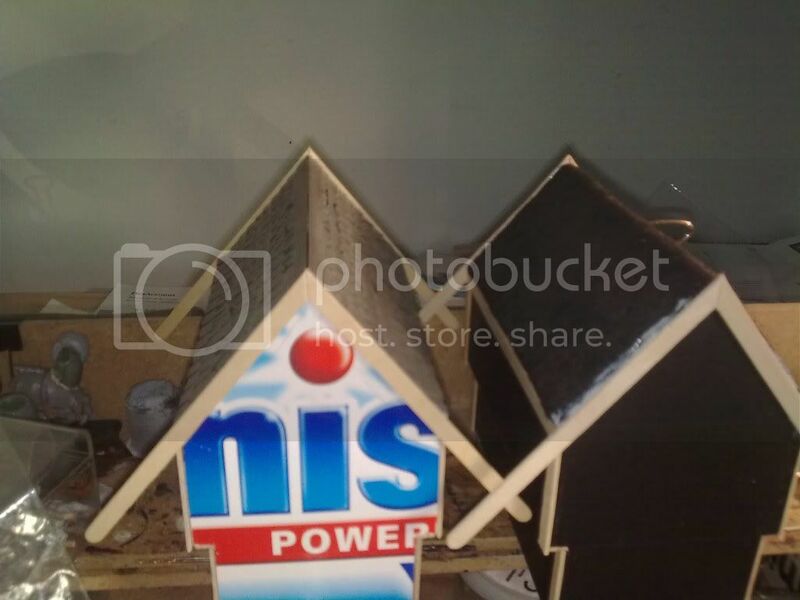 On a real house these would sit underneath but we’re building for durability and both roof types need the join between their roofing material and the roof covering. The stirrers need to be cut at a 45 degree angle at one end to meet at the top and then just glued on. They generally don’t need pinning in place. 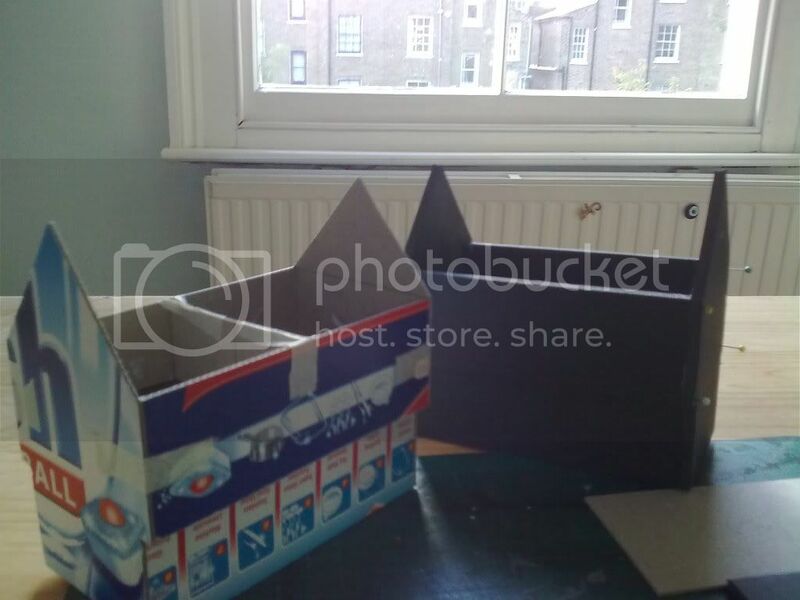 The cardboard roof particularly needs a little extra care at this stage; as you can see in the picture I have made sure that it overlaps the roof a little. 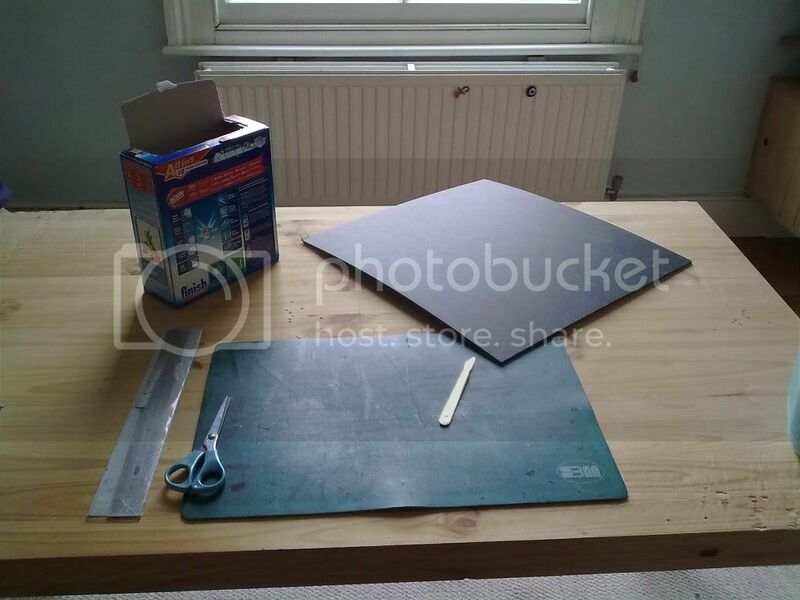 This will protect the cardboard roof titles and at the top where the stirrers meet will enable me to glue on some extra protection, more on that in a bit. While they were drying I glued on the first floor beam on the sides of the buildings in preparation for finishing the angled cuts. When the side eves were dry I clipped off the access stirrers leaving me with 8 (4 from each house) short angled pieces of stirrer. These bits have the correct angles to complete the edge of the upper floors at the sides of the houses, thus minimising even further the measuring you have to do. I hold them in place and with a pencil mark on the length they need to be cut to, cut and glue in place. On the cardboard roof I added a BBQ skewer, cut to size, to the very top. The eves that overlap at the top give you something extra to glue it to, along with the ridge at the top of the roof. 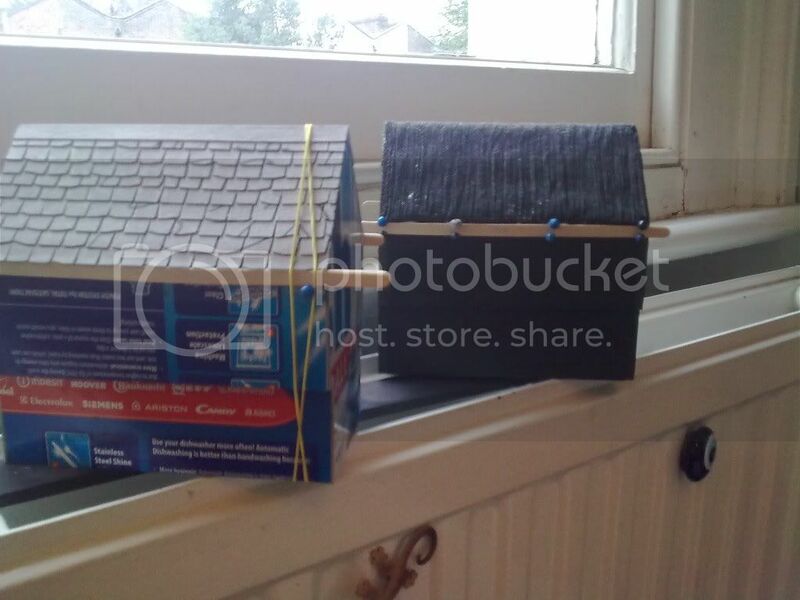 This just protects the roof from damage and is kinda optional. This end the “complex” coffee stirrer cutting, everything else from here on is making-the-beam-structure of the house, glue on, clip to size and repeat make sure you overlap at the corners. I tend to break the walls into 3 sections and the sides in 2 as you can see in the picture, I just worked out that this was the minimum required to get the effect were going for here. The next bit is adding the diagonal “support beams” (less is more on these), windows and the door (again 2-3 per side is enough). The support beams are more coffee stirrers and the window/ door frames are just match sticks cut to size. On the cardboard house you can’t really see the detail as the pattern on the cardboard is a little overwhelming but on the black foamboard one it’s pretty clear. For the door I have added a door handle (from a canon sprue in this case but on others just one of the pins used in the construction) and some bits to represent hinges (a thin strip of coffee stirrer). You can also add other details at this point, I have glued a shield boss on just to add a little more detail. These are good in so far as they lay flat on the surface and as such won’t get knocked off through rough treatment and that has to be the rule of thumb with scenery to be used in a club or store. The gargoyles, pub signs and weather vanes look great right up to the point some ham fisted oik drops something else in on top of them and smashes them off. Once the whole thing had been left to dry I smeared a little glue, with my finger, into any small gaps that appeared in-between the stirrers and between the walls, this’ll just help it to bond the whole thing together and make painting a little easier (no random gaps to shove a paint brush into). Once that was dry I also tickled them both with a bit of sand paper, it’s far from essential to do this but it just takes off any sharp edges so they dent each other rather than poke holes if they’re ever packed roughly. Part three will be painting. I am a scenery painting fascist; too often have I seen fantastic creations being made with care and intricate detail only to be ruined at the painting stage. 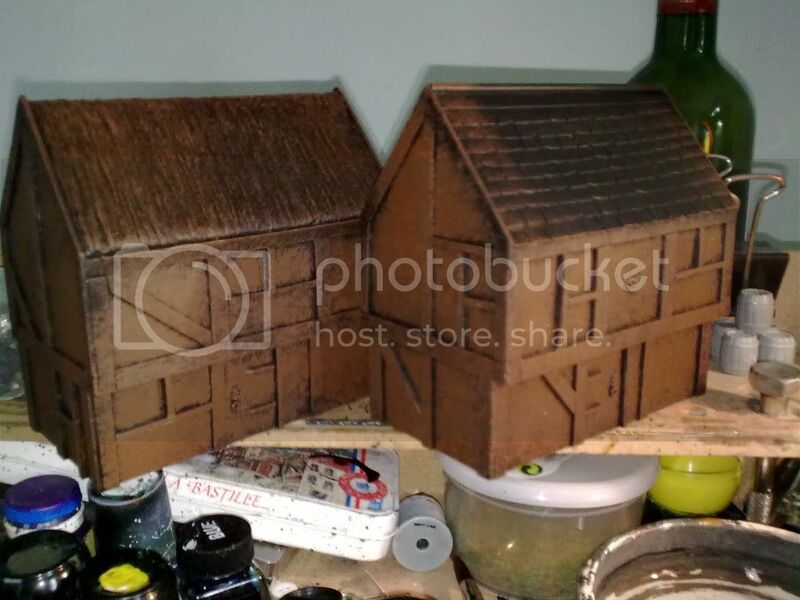 The number one crime is textured paint; unlike the spray texture GW sells, textured paint covers in a think layer of crud and obscures all detail. It will always give the impression that what ever you have painted with it has been pebble dashed or covered by a mud slide, if this is not the look you’re going for don’t use it, it adds only one type of texture. The other is bad dry brushing; If you can see the giant brush strokes so can every one else and you’ve done it wrong. Dry brushing, the secret is in the name! 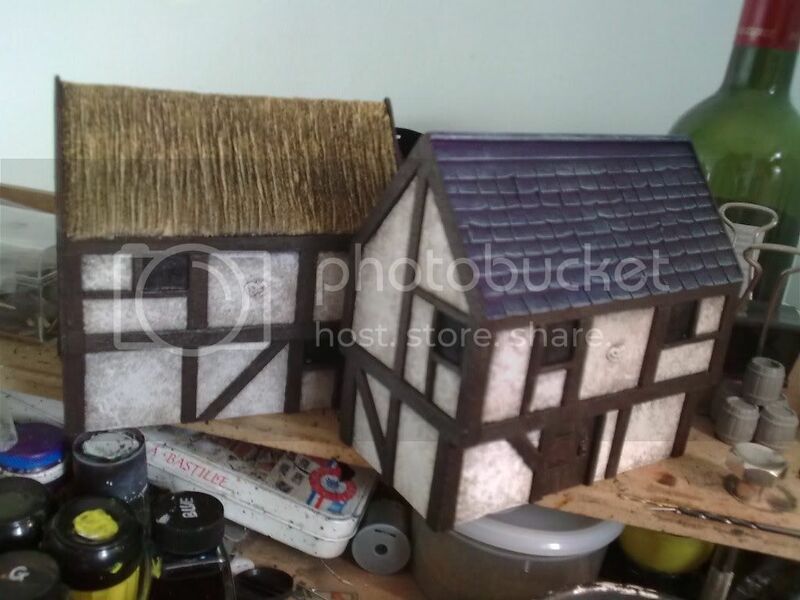 Painting scenery is about giving the impression of extra detail and highlighting that which you have added. If you add detail at the construction stage please pay it attention at the painting stage, after all you put it there for a reason. Enough of the narcissistic rant and on with the painting. 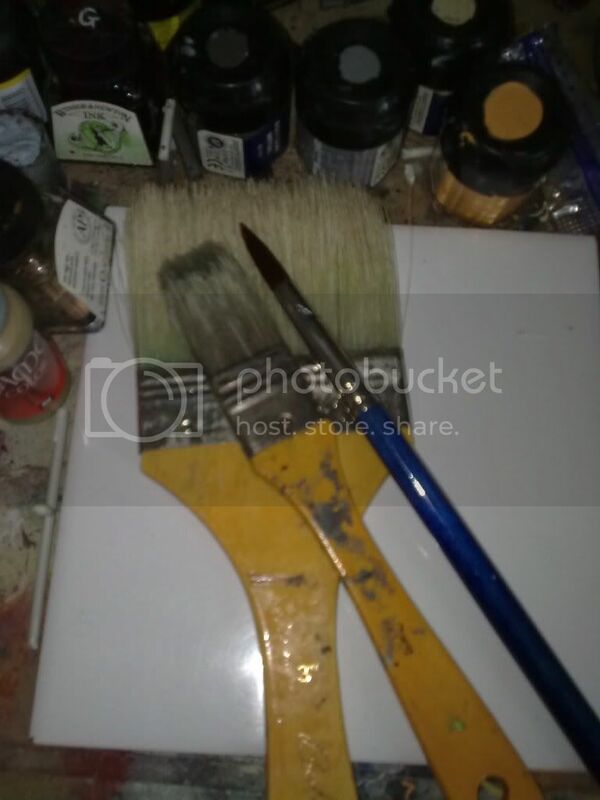 The three main bushes I use when painting these houses are tank brush, small house brush (the medium sized one) and big fat brush. This is mainly because most of the detail on these houses is already there and the contrast between the timber frames and white walls is generally enough to give the impression of detail. That, and the fact we’re painting in volume. 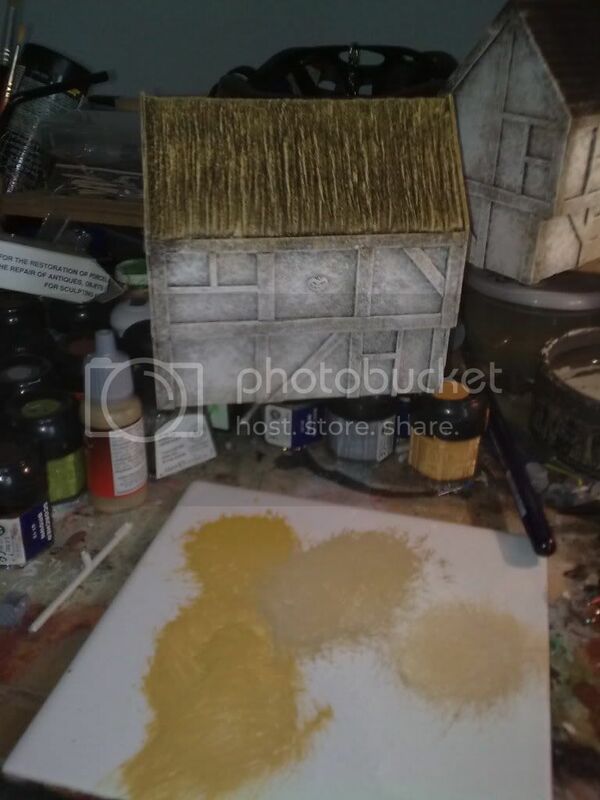 A quick note on the paint I use for scenery. In short, cheap. You’re painting lots of big surfaces here and the little modelling pots of paint are great but you’ll get through them fast. 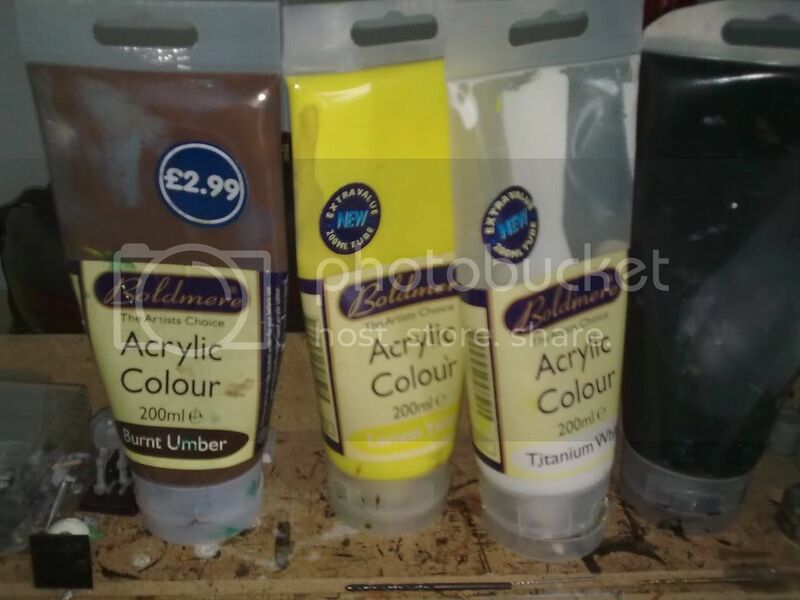 I use some cheap acrylic paint tubes from “The Works” £3 for a massive tube, but any art shop will have a cheapo range. As with any miniature I started with a base coat, black in this case, and painted it on by hand. Spray paints (also expensive) can’t be relied on to get into the cracks where it’s really needed so using the small house brush undercoated the houses thoroughly with black. 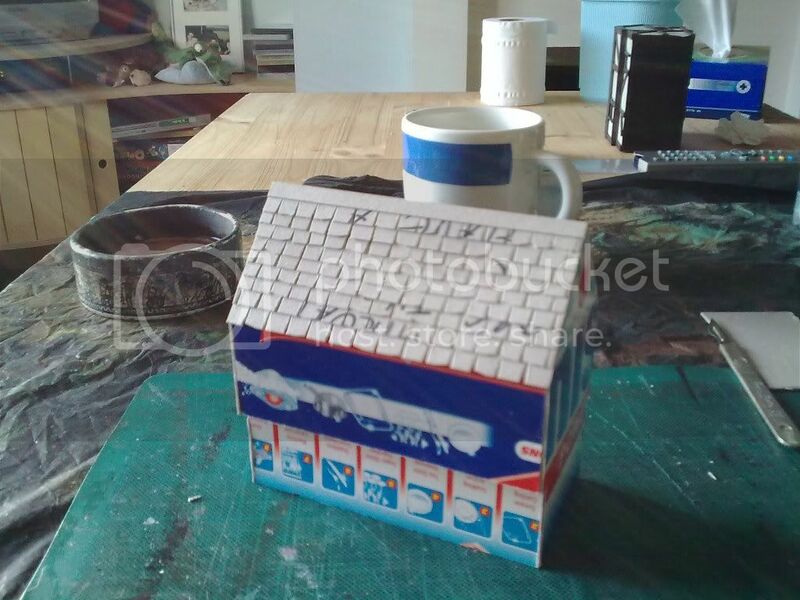 The cardboard house I made with the original box’s patterned exterior facing out wards; the idea was, one to show what it was made of and the other to use the slightly water resistant outside of the box to prevent the corrugated cardboard from soaking up the moisture in the paint, going wrinkly and showing its corrugations. Turns out the water resistant outside was marginally paint resistant too and it required a second coat. and finally very lightly with white. Sadly it’s too easy to get carried away stabbing these little houses with the brush; less, in the case of stippling, is definitely more. You always want to show some of the previous colour through so less is required the lighter you go. With some houses I made for the Clapham club I got carried away with the white and ended up obscuring any of the “texture” I had added. They still look ok but I know they could have been better. 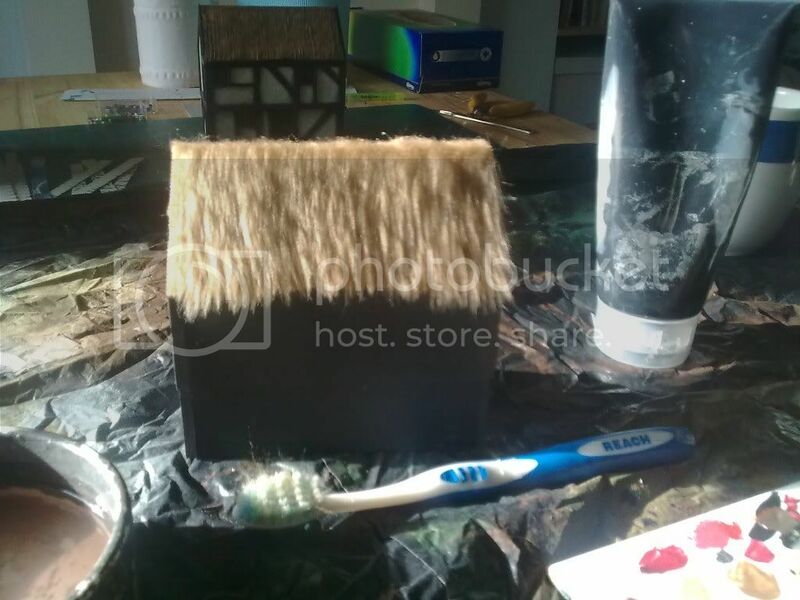 The thatch was heavily brushed with brown at the same time as the walls. All that needed to be done was to just dry brush using the three colours on the title, moving from a straw brown to a light dry brush of a pale cream colour. 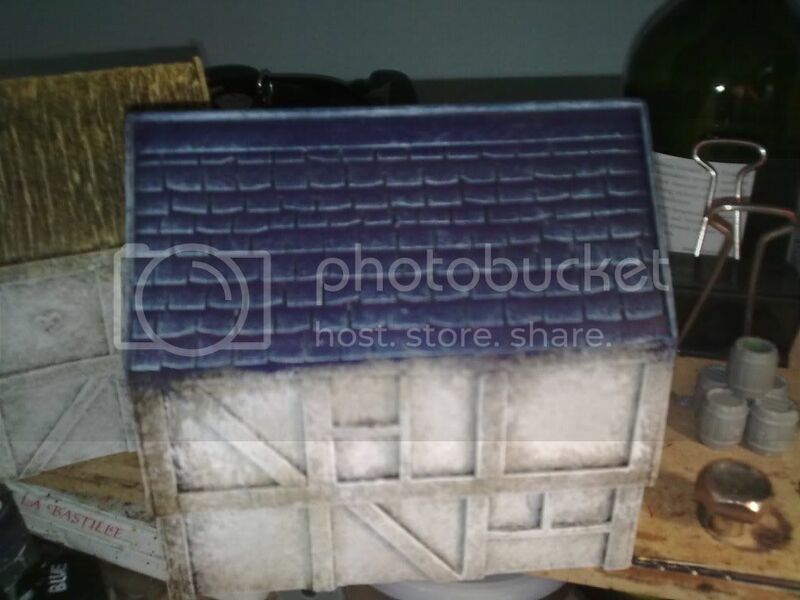 The tiles were painted GW midnight blue and then dry brushed with codex gray and then lightly dry brushed with another lighter gray. Takes the longest to paint on these coz you have to paint the edges of the coffee stirrers. I use a tank brush but maybe a smaller one would be easier, but then it wouldn’t hold as much paint, so perhaps not. If you get some paint on the walls you can always have some water and a brush standing by just to take it off and if you forget you can always stipple with a smaller brush over the top once it’s dry (it’s very forgiving paint job). 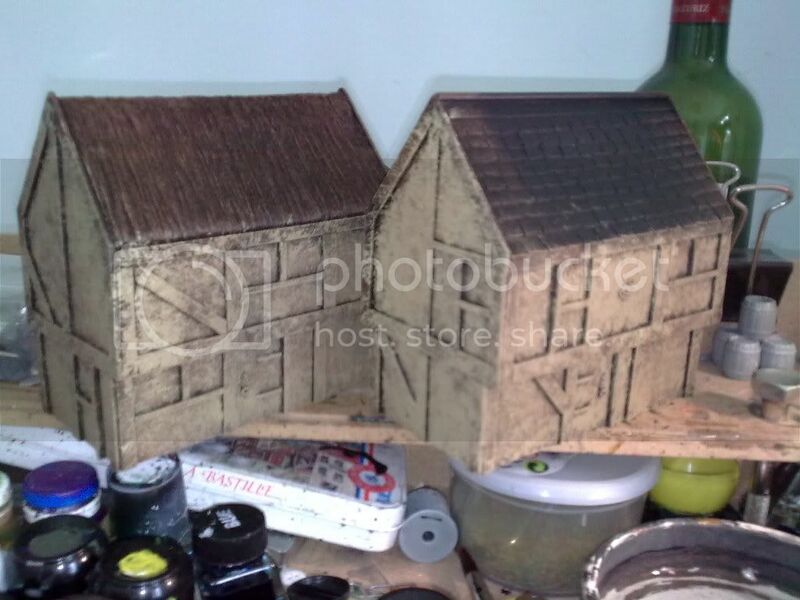 I used a darker brown that I did for the undercoat on the walls (just mixed some black in with the brown paint). I painted the door too. This is the stage which takes these houses from looking like a right mess to more like the finished product as you can see. Decide on which bits will be the windows and paint black. I have been painting “bars” on the windows… don’t know why… it fills the space. You could paint them blue and simulate a led lattice or something but I’m just trying to be quick. I also paint some rough wood grain on the doors and paint the hinges and door handle black. I also painted the little shield boss detail on the wall. 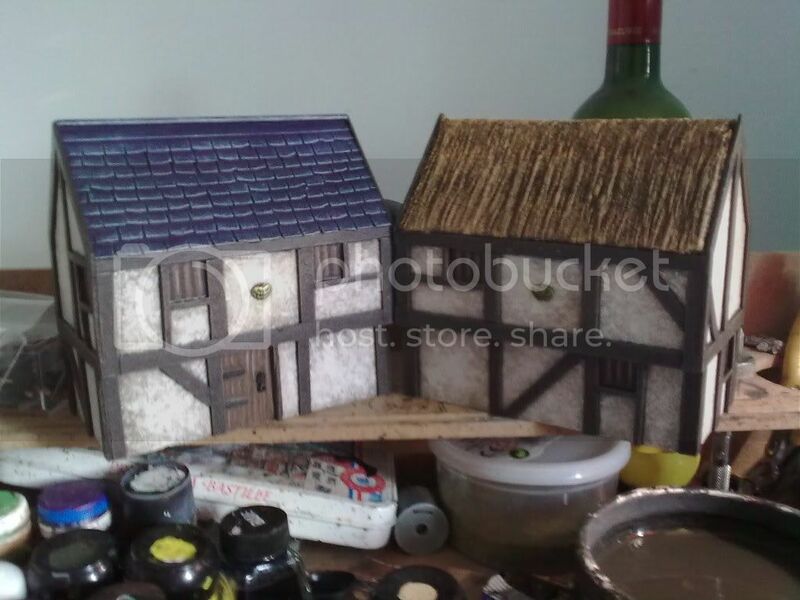 The finishing stage on these houses was a very, very light dry brush of bleached bone. It just takes the edge off the dark brown timbers. And if it gets anywhere else it’s so light it mixes in as another high light.